Saintes is such a pretty place that it's pleasant just to walk along the banks of the Charente River or wander through the pedestrian streets of the historic center on the left bank. Strolling along theright bank of the Charente River in the city center you can't miss the huge, gleaming white marble triumphal Arch of Germanicus. A local citizen built itin the years 18-19 CE to honor the Emperor Tiberius and his two sons, Drusus and Germanicus. 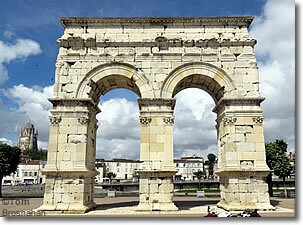 The arch marked the end of the Roman road from Lyon, and the gateway to a bridge across the river that led to the left bank and into the Roman city of Mediolanum Santonum. The dedicatory inscription begins with the name Germanicus, which is perhaps why the arch bears that name today. In 1843, in preparation for construction along the river bank, the arch was disassembled, moved 15 meters, and re-erected in 1851 in its present location. Today the arch is Saintes' favorite selfie spot. Visitors interested in Roman artifacts will want to visit the Musée archéologique, next to the Office de Tourisme and not far from the Arc de Germanicus on the right bank of the Charente River, with its Roman sculptures, inscriptions, and a restored Roman wagon from the 1st century CE. At the Musée du Présidial the attraction is ceramics and paintings dating from the 15th through 18th century, produced in the Saintonge region. For later paintings (59th and 20th centuries) and Sèvres porcelain, your goal is the Musée de l'Échevinage established in the former Hôtel de Ville in rue Alsace-Lorraine. Enter through La Musardière, a popular café-restaurant attached to the museum. The ruins of the Roman Amphiteater allow you to see its arches built into the hillside, and to get an idea of its size, but better examples of Roman amphitheaters exist in Provence, such as the ones in Arles, Nîmes and Orange. The tall bell tower of the cathedral dominates the skyline of the historic center on the left bank of the Charente. Constructed on the site of a Roman-era church, it was rebuilt in the 12th century, then again in the 15th and 17th centuries. The Abbaye de Sainte-Marie-des-Dames, usually called the Abbaye aux Dames, is a large complex of medieval buildings on the right bank of the river a short walk from the Arch of Germanicus. Founded in 1047 by the Count of Anjou, today it is famous for its musical concerts (La Cité Musicale) held in various medieval chambers and courtyards. Dating from 1096, the church was dedicated to Saintes' first martyr, Saint Eutropius, who is entombed here. The church and adjoining Benedictine abbey were a stop on the pilgrimage route of Saint James of Compostella. There is an open-air market every day except Monday in Saintes, but the location changes as it moves around the city. It's often held in the Place Saint-Pierre next to the cathedral. Look for signs telling you the day's location. The municipal market building is on the left bank just east of the Place Saint-Pierre, between the cathedral and the Quai de Verdun on the river bank. Look for the passerelle (pedestrian footbridge) over the river. The market is open daily. Arc de Germanicus with the bell tower of the Cathédrale Saint-Pierre to the left across the river. 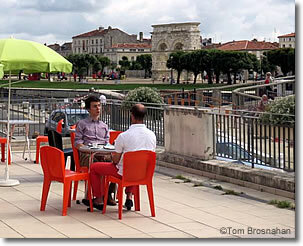 Café by the Charente River in Saintes.